The New Humanitarian | How to reverse Buddhism’s radical turn in Southeast Asia? How to reverse Buddhism’s radical turn in Southeast Asia? 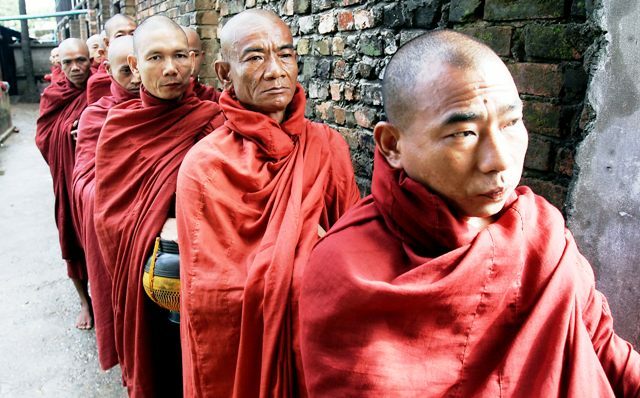 Influential Buddhist monks in Myanmar have been aggravating longstanding tensions between the country’s Buddhist and Muslim communities since violence erupted between the two groups in 2012, say experts. “The Burmese Buddhist monks may not have initiated the violence but they rode the wave and began to incite more,” said Michael Jerryson, a religious studies professor and co-editor of Buddhist Warfare, a recent 2010 publication examining the violent side of Buddhism in Southeast Asia and how Buddhist organizations there have used religious images and rhetoric to support “military conquest”. For example, the “969” movement (the numbers hold significance in Buddhist teachings) is a nationalist anti-Muslim campaign founded in early 2013 in Myanmar to protect Burmese Buddhist identity. Leaders have referred to Muslims in derogatory terms and accused them of attempting to dominate Burmese society politically and economically. Supporters wear stickers identifying their membership, which are also posted on Buddhist-owned shops and kiosks to encourage Buddhists to conduct business only with other Buddhists, and condemn those who buy from Muslims. Audio CDs blast hate rhetoric in restaurants and shops across the country, including the speeches of an influential and well-known monk, U-Wirathu, who has sparked fierce international criticism for his anti- Muslim speeches, according to local news. Human Rights Watch (HRW) has accused the government of not doing enough to stem his and other Burmese monks’ hate speech. “The government is not implementing the basic rule of law to hold instigators of violence accountable... If you instigate and engage in violence you should be held responsible, whether you are wearing a saffron robe or not,” said Phil Robertson, deputy executive director for HRW in Southeast Asia. While the ideals of Buddhist canonical texts promote peace and pacifism, discrepancies between reality and precepts “easily flourish” in times of social, political and economic insecurity, such as Myanmar's current transition to democracy, according to Jerryson. Monks serve as one of society’s main moral compasses in Theravada Buddhism - practised in Southeast Asian countries including Myanmar, Sri Lanka, Thailand, Cambodia, and Laos. Their influence has reached into the political life of most of these countries, creating a fusion between religion and national identity. In Myanmar’s ethnically and religiously heterogeneous society, non-Buddhists are increasingly feeling the weight of Buddhist radicalism, say analysts. Despite the country’s demographics boasting a 90 percent Buddhist majority of Myanmar's estimated 60 million people, the “969” campaign is predicated on fear of the country being overtaken by Muslims (some 5 percent of the population, most of whom are both disenfranchized and stateless) determined to spread Islam and destroy Buddhist communities. “Even the most peace-loving religious traditions can be fused with movements of ethnic anger and political power that lead to violence,” Mark Juergensmeyer, the director of the Orfalea Centre for Global and International Studies at the University of Santa Barbara, California, and expert on religious violence, told IRIN. “If Islam, a religious tradition whose very name means peace, can be associated with violence [by extremists] it should be no surprise that there are angry Buddhists who become violent as well,” explained Juergensmeyer. The entanglement of Buddhism with the Burmese national identity dates back to the 1962 advent of military rule, and continues even after a quasi-civilian government came to power in 2011. Burmese politics promote a homogenous Buddhist, Burmese identity through longstanding state persecution of non-Buddhists, according to the Oxford Burma Alliance (OBA), an advocacy group based in London's Oxford University promoting the rights of ethnic minorities in Myanmar. “Persecution has always been part of the national policy of `Burmanisation', an ultra-nationalist ideology based on the racial purity of the Burman ethnicity and its Buddhist faith,” reported OBA. "When monks tell people violence is OK, and that it will gain [karmic] merit for people, it is a powerful enabling force"
Monks have historically played a prominent political role in Myanmar, most notably in the 2007 peaceful demonstration known as the Saffron Revolution. Tens of thousands of monks marched to denounce the military regime’s brutality, which resulted in thousands of arrests of monastic community members. However, six years later, the monastic marchers are no longer preaching pacifism. Violence targeting ethnic Rohingya (Muslims of Indian ancestry based in Rakhine State near the Bangladesh border) in June and October 2012 killed at least 250 and has resulted in the segregation of 140,000 Muslim Rohingya in almost 90 closed camps for internally displaced persons near Sittwe, the capital of Rakhine State. Rioting spread in March 2013 to the country’s central city of Meikhtila, destroying up to 1,200 houses and killing at least 44 people. The latest violence marked the first time Burmese monks openly incited mass killings and the destruction of property. And though 25 Buddhists were recently sentenced to as many as 15 years imprisonment for Meikhtila’s two days of bloodshed, these rulings followed weeks of punishments meted out almost exclusively to Muslims for violence that drove out some 30,000 Muslims from the city. While the Buddhist teaching on `ahimsa’, or non-violence, is one of the religion’s five fundamental precepts, the impact on a person’s future life (another Buddhist belief is reincarnation) is not equal for everyone, but rather is based on the type of life form committing the violence and the intention of the perpetrator. In Myanmar monks have used this belief to rationalize their dehumanization of Muslims, and classify violence against them as acts of self-defence, as long as the monks can prove “pure intentions”. “Across Buddhist traditions, intention is an exception to the rule when committing violence,” said Jerryson. “If violence is seen as being a way to protect Buddhism and you have pure thoughts to help or defend that, then it becomes [acceptable],” he added. But members in the international Buddhist community have condemned what they call manipulation of an exception to justify violence. “We are deeply ashamed by the appalling treatment of Muslims now occurring in some Buddhist countries,” said Richard Gombrich, the founder and director of the Oxford Centre for Buddhist studies, referring to ongoing violence against Muslims in Myanmar, Sri Lanka and southern Thailand. “Theravada Buddhists, and particularly their leaders, are betraying the Buddhist value of non-violence, let alone kindness and compassion,” he added. Critics of Buddhist-instigated violence say monks are tapping into long-standing animosity between Buddhists and Muslims at a time of enormous social upheaval. “Muslims have become scapegoats to displace people's fear and frustrations,” said the author Jerryson. Since November 2011, Myanmar has opened up its economy to foreign investment, increased political space for disparate and previously suppressed ethnic groups - such as the Rakhine Buddhists - to have a voice, and lifted press censorship laws. Living in the second poorest state in Myanmar, Rakhine Buddhists have suffered marginalization from the central government as an ethnic minority that has long fought for greater political power in the majority Burman-ruled country. Against a backdrop of economic and political change, “people look to monks to guide them; monks are like externalized super egos for the community. When monks tell people violence is OK, and that it will gain [karmic] merit for people, it is a powerful enabling force,” said Jerryson, the religious studies professor. Strong political and public support for “969” leaders and extremist monks have made it increasingly difficult for any Buddhists to speak out, while the near absence of government policies to promote community reconciliation heightens the risk of the re-emergence of violence. Meanwhile, according to Refugees International, a US-based advocacy organization for displaced persons, Myanmar’s government continues to condone radical violent behaviour against Muslims by allowing hate speech to go unpunished, failing to protect members of the Rohingya community during recent outbreaks of violence, and continuing to arrest Muslim leaders in response to recent violence in disproportionate numbers. Without addressing root causes as well as the grievances of all affected populations equally, inter-communal violence may spread to neighbouring countries hosting Buddhist and Muslim populations and pose “a further threat” to regional security and stability, warned the Organization of the Islamic Conference (OIC). But all of this would require a shift in Myanmar's attempt to create a Buddhist national identity. “Reconciliation requires an ability by the state to establish a moratorium on violence. The idea that being Burmese means being Buddhist has to be put away,” concluded Jerryson.